for marriage of Arman Merriam to Madelon Richardson. 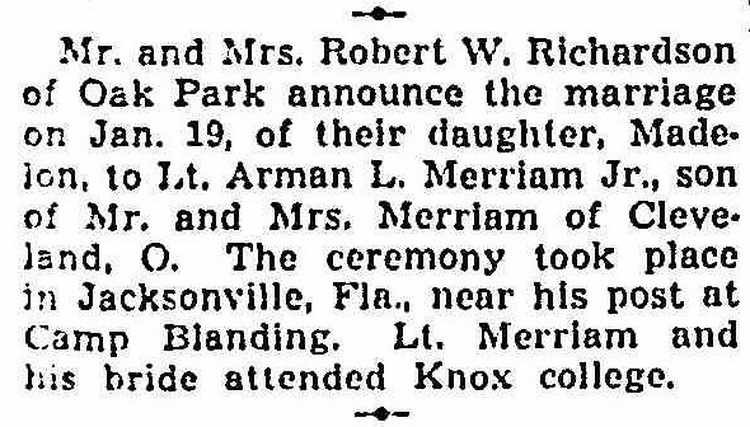 They were married on January 19, 1943 in Jacksonville, Florida, a location very convenient to Camp Blanding. HOUSTON ---UP--- Nine-year-old Arman Merriam III was drowned late Wednesday while diving for pennies in a swimming pool at an eight-year-old girl's birthday party. The boy and two companions were having a contest to see who could recover the most pennies in abut eight feet of water in the pool at Forest Club, where eight-year-old Pamela Greenwood was having her birthday party. Witnesses told police that two young guests ran to lifeguard George W. Scott, 42, and told him that Arman was lying on the bottom of the pool in water eight feet deep. The lifeguard pulled the boy from the water and rendered artificial respiration until the Harris county emergency corps arrived with a resuscitator. Efforts to revive the boy were unsuccessful and he was pronounced dead at Texas Children's Hospital. He was the son of Mr. and Mrs.. Arman Merriam, Jr., of Houston. Arman L. Merriam enlisted n the Army in Cleveland, OH on 28 Feb. 1941 after completing two years of study at Knox College in Galesburg, IL. He was selected for OCS and also volunteered for parachutist duty. Which event preceded the other is not known but on 1 Oct 1942 2nd Lt. Merriam was transferred from the Parachute School as part of the Cadre team and was assigned to Company A of the 508th at Camp Blanding, FL. On 30 Sept 1944, Arman was listed as "seriously wounded" and sent to an unknown field hospital. After more than two months of treatment he was transferred to the hospital at the Parachute School, Ft. Benning Ga. Following his separation from the service, Arman was employed as a Product Manager for an unknown corporation. While living in Cleveland, Ohio they had a son Armand L. Merriam, III, born on 3 May 1946. Arman's work eventually caused him to relocate to Houston, TX. On 18 May 1955, he and his family were guests at a birthday party being held for an 8-year-old girl. A competition was set up for the children to dive for pennies in the pool and somehow nine-year-old Arman L. Merriam III drowned. That event may have sparked a divorce as when Arman died on 6 Oct 1962 his wife's name was listed as Anne, not Madelon.